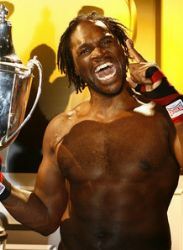 AUDLEY HARRISON kept his boxing career alive with victory in Barry Hearn’s Prizefighter Heavyweights III tournament. Harrison, 37, insisted he would retire if he suffered a disappointing evening at London’s ExCel but instead scooped the £32,000 top prize. Former Olympic Games gold medalist Harrison claimed the Prizefighter trophy with a second round knockout of Irishman Coleman Barrett in the final. “I think I’ve now created an opportunity where hopefully I can achieve my goals,” said Harrison, who was still booed by a number of fans. This latest eight-man, one-night Prizefighter tournament was held in front of 5,000 fans at a packed ExCel with shocks and knockdowns galore with fighters hitting the canvas seven times. Harrison claimed the title after a stoppage of Scott Belshaw in the quarter-final then a points triumph over Danny Hughes in the semi-final before the victory over Barrett. “Everyone thought the door was closed for me after I lost in December against Martin Rogan but it wasn’t,” added Harrison. “The place was sold out and I’ve seen loads of coverage in the papers so there’s still interest in Audley Harrison. “After those three performances, there’s still hope for me and hope for Britain to have a World Champion. “My critics are always going to be there and the battering I take out of the ring is why I live in America. “It’s an unwarranted battering but I’m not going to cry about it. My left hand was firing and I had three good victories. While Harrison kept his career alive, there will be serious questions as to Danny Williams’ future in the sport. He was British Champion going into the event but a sensational points defeat against unfancied Carl Baker in the quarter-final means the British title will become vacant. Williams, who was 1/10 to defeat Baker, had hoped to fight arch rival Harrison in the final but was knocked down twice in the opening round by Baker. Barrett had reached the final after scraping past Baker in the semi-final and Welshman Scott Gammer in the quarter-final, with both victories coming on points. Hughes claimed the most impressive victory of the night in his quarter-final tie when he stopped Birmingham’s Neil Perkins after only 45 seconds.